Specialist electrical consultancy to investigate and recommend remedial action as a result of a main cable overheating at Dimension Data House. ErgoPlus Facilities conducted a thorough inspection of the thermoplastic armoured cabling, checking individual conductors within the main distribution panel and temperatures. 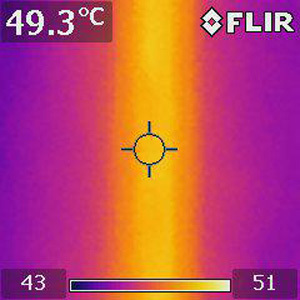 We identified fractures in the external insulation, and established that the cabling that fed the main distribution in the plant room was not fit for purpose. We provided the client with a detailed report and three potential courses of action. Our recommend option was upgrade the overcurrent protective device to 500amps with the replacement of the existing two cables with 185mm cables. This not only covered the current requirements for power, but also allowed room for both expansion and the larger currents associated with the additional plant used in the summer months. We also recommended replacing the existing cables.